You are here: Home / DIY/Maintenance / How to Change Your In-Home Furnace Air Filter? Changing your HVAC filter (furnace filter, air filter, A/C filter, etc.) is one of the most critical things you can do in your home. It is also one of the easiest. 1. Locate/remove the vent cover. Some HVAC systems will place the filter in the intake. This will look like a large ventilation grate in a wall, ceiling, or floor. Some systems will have the filter inside the unit itself. Find out which one is yours before proceeding further. 2. Take note of the direction the air filter goes into the unit by observing the direction of the arrows. Air filters are designed to filter the air from one direction. If it is placed in the wrong direction, the filter will fall apart or collapse as it loads with dirt, dust, etc. Note: the air filter arrows should always point in the direction the air is flowing. If you do not see any arrows on the filter, it does not matter which direction it points. 3. Take out the old filter. When doing so, place it into a bag to avoid getting dust onto the ground. 4. Place in the new filter with the arrows facing the same way as the previous filter. 5. Replace the vent cover and any clips used to hold the air filter in place. That’s it. Changing your home air filter is easy and takes less than 3 minutes of your time. 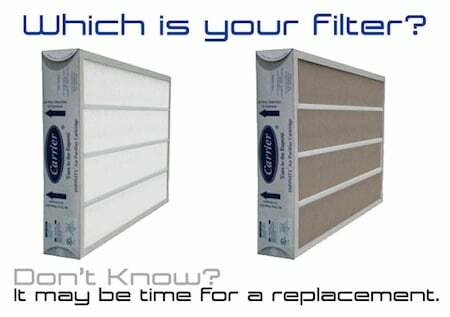 It is best to check your filter on a monthly basis, and replace it when it is dirty (generally, it should be replaced every 3 months). It is always advisable to have some extras on hand so you are ready to go for your next air filter change. the arrow on the filter should face the furnace unit or toward the air ducts? I have asked as many as 8 people (home depot, etc) and have gotten a different answer.